While not everyone has access to horses, those that do are some of the luckiest people you can find. If you are one of those lucky people who either own a horse or horses, or have access to riding at least semi-regularly, then the sites listed below might be of interest. While it is unlikely that many people would list horseback riding as a 'dealbreaker' in finding a potential partner, it doesn't hurt to share a love for horses and riding. Take advantage of the fact that the sites listed here are filled with horse loving singles, who are looking for fun people who share their passion for horses and horseback riding. 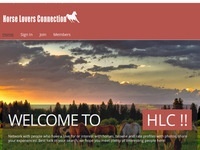 "A 100% free online dating & social networking site for horse lovers." If you love horses, and own or ride regularly, then take advantage of Equestrian Personals to meet others who share your love of riding. Everyone puts 'I love horseback riding on a beach' in their online dating profile...but the people on Equestrian Cupid mean it. If you actually really do ride horses, at least every now and then, Equestrian Cupid is for you. Sign up to meet other horse loving singles, and break the ice by talking about the last time you went out riding. 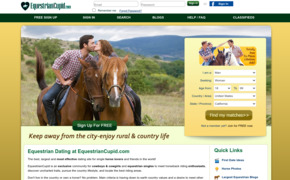 A personal ad dating service where single horsepeople find friendship, romance and love! Designed exclusively for those that have a passion for horses and the simple country life. "For the Single, Sports Minded, Horse Enthusiast!" "Love Horse is a dating and friendship service designed for horse and countryside lovers and anyone who wants to date such people. Whether you are looking for romance, flirtation, penpals, or just some new friends who share your passions for equestrian and country pursuits, you'll find exactly who you are looking for here locally or around the world."